Trying To Knit A Flat Circle? Geometry to the Rescue! I learned a lot making my contribution for the All We Are Saying peace blanket. As soon as I started, I should have known geometry would rear its ugly head. All I wanted to do was make a circle in a square using yarn. MISTAKE NUMBER ONE: Deciding to make a circle. Crochet rocks flat circles, as the wonderful mandalas designed by Marinke prove. However, I have a lot more experience with knitting, and since I need a square to go around my circle, I decided to knit instead of crocheting. 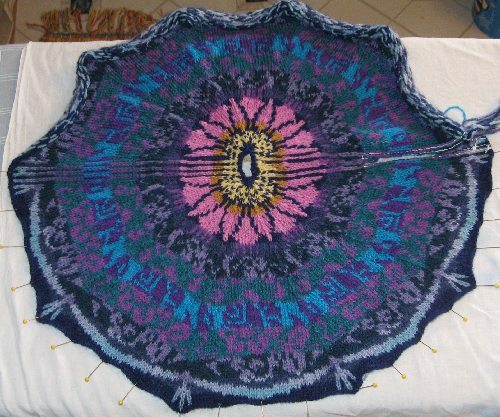 Crocheted mandala designed by Marinke… and so round! I know that knitting a flat circular shape is possible. In fact, I was certain it would be easy. The sides of the East Meets West Satchel I made a few years ago were originally knit as one big flat circle. (Actually, it’s a decagon — a polygon with ten sides. But it approximates a circle and generates a circular pattern, which is what I wanted.) The only trick was figuring out how many stitches to increase by as the circle got bigger. My first “circle” was a complete experiment. I just added stitches when it felt right. Not surprisingly, when the piece was big enough to transfer from double-pointed needles to a circular needle, I discovered that my circle was actually a circle and a half and not even remotely flat. MISTAKE NUMBER THREE: Winging it. Since I had a deadline to meet, I stopped re-inventing the wheel. 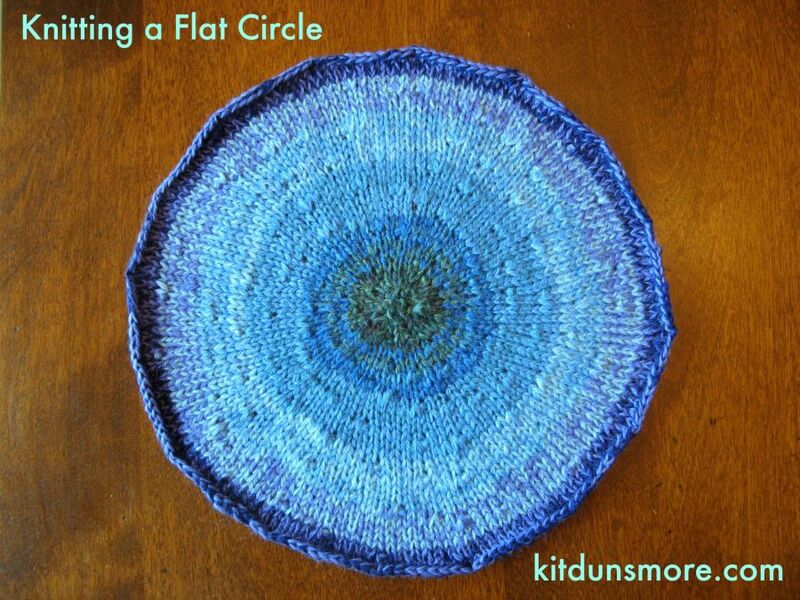 I got online and found a pattern for knitting flat circles. The pattern was simple and what I expected. Unfortunately, it didn’t work. After 10 rows, my flat circle looked like a mouse hat. I figured I was doing something wrong, unraveled it, and tried again. I got a cup, when I wanted a coaster. By now, I was annoyed. The pattern promised a flat circle but didn’t actually make a flat circle. The pattern didn’t say anything about gauge (the size of the stitches). The instructions were extrapolated from another pattern, and the knitter must have used yarn and needles similar to those called for in the original pattern, because the circle in the picture is flat. I tried to fix the non-flat circle pattern with my own adjustments. Things improved, but the circle wasn’t flat no matter what I did. MISTAKE NUMBER FOUR: Trying to fix something that was clearly broken. I stepped back and thought about what I was doing, and that’s when the light bulb went off. If the size of the stitches mattered, then I needed to apply geometry. THE THING I DID RIGHT: Stopping a minute to think about what I was trying to do. THE OTHER THING I DID RIGHT: Realizing geometry was the answer. Math often comes up when knitting, so I wasn’t completely daunted. However I got a C in geometry in high school, something my husband loves to tease me about since I also worked as a computer programmer for years. Although I am good at math in general, I’m not quite as confident when I have to use my ancient C-level geometry skills. The key was to think about the circles my knitting was making. I looked up the equation for calculating the circumference of a circle (2πr) to make sure I had it right. Then I got out my gauge swatch (which I already had for this particular yarn and needle size) to measure both the height and width of my knit stitch. 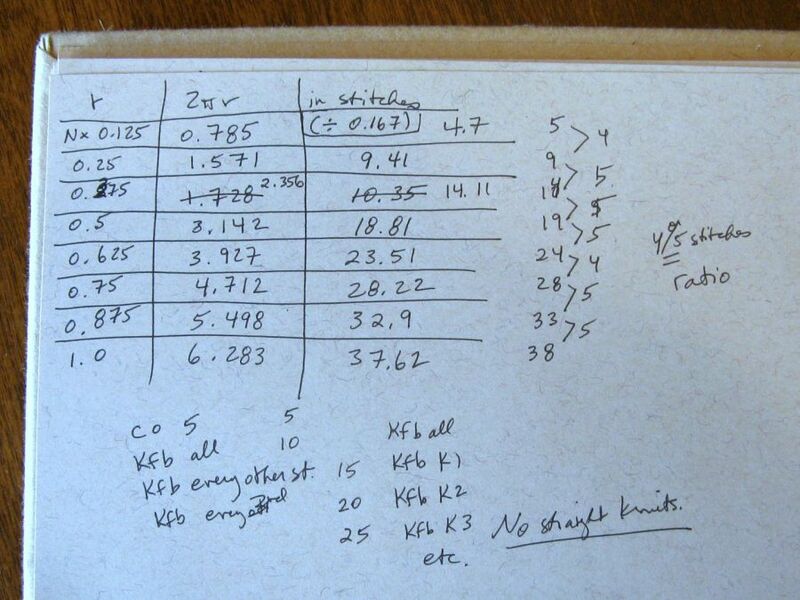 My calculations, complete with mistakes. I calculated number of stitches for the outside edge of each successive row of my circle and noticed a pattern was forming. The difference between the outer circumference of adjacent rows of knitting was a fixed number and that number told me exactly how many stitches I needed to increase in every row to get a flat circle. When I did the algebra (which is probably where I should have started), I found the single equation used in my simple pattern. I sat down to knit, finally certain I would have my circle. However, increasing by five stitches in the same places every round gave me a pentagon, not a circle. MISTAKE NUMBER FIVE: Spacing my increases at regular intervals. Flat but not exactly a circle… My regular increases are making a pentagon! I started again, this time knowing what I needed to do: increase by the same number of stitches in every row, at irregular intervals. Finally, I got something circular in design. That I had to chase my tail a bit before realizing the elegant and simple solution to my knitting problem could be construed as proof that my C in geometry was well-deserved. However, I’d like to think my teacher would be proud to learn that more than 30 years later, I am finding ways to use geometry in my everyday life. Of course, my ordeal was not yet over. I had to solve the problem of adding corners to my circle to make a square, plus my first block came out too large and I had to do it all over AGAIN. In the end, I think all the effort was worth it. My finished work is on display, starting today, along with the other textile contributions about world peace at the All We Are Saying show in Newcastle Upon Tyne, England. Who knew a circle would be so much work? Can you share a picture of your quilt square? And finally is there a link where we can see the finished quilt? I certainly didn’t think knitting a circle would take this much effort! I don’t think they’ll have constructed the final blankets until after the show (which started yesterday). I’ll be sure to provide links to that stuff when I have them. Thanks. I had fun mixing the yarn as I knitted. I am a research assistant at Indiana University working on Recrafting Math. I looked at your math chart but don’t understand it. Would you be willing to share the math involved. I was good at geometry 30 years ago but can’t remember a thing! Thanks. I didn’t include the math because I didn’t think anyone would care! It’s actually pretty simple. 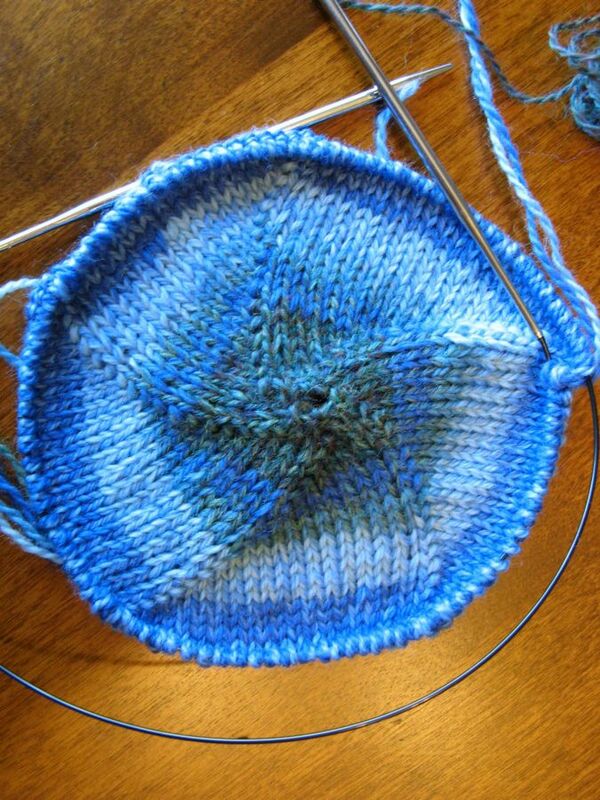 The number of stitches to increase from one row to the next depends on how much bigger around the next circle is. So you have two circles with the same center. The first circle has a radius of r. The second has a radius of r + N. What we want to know is the difference in the circumferences. Since circumference = 2*pi*r, the calculation is 2*pi*(r+N) – 2*pi*r. Expand and cancel, and you get 2*pi*N. If we know N (we do: it’s the height of our knit stitch), we can calculate the difference in inches. Then you just multiply by your gauge (stitches/inch) to get the number of stitches to increase by for each row. Hi can you please post the pattern to this circle? Pingback: Oh minion me! – Let's talk about S.E.X. Sorry to hear you are hurting. It does make knitting hard when our hands are hurting.